Above: A humble offering from Geotypografika. 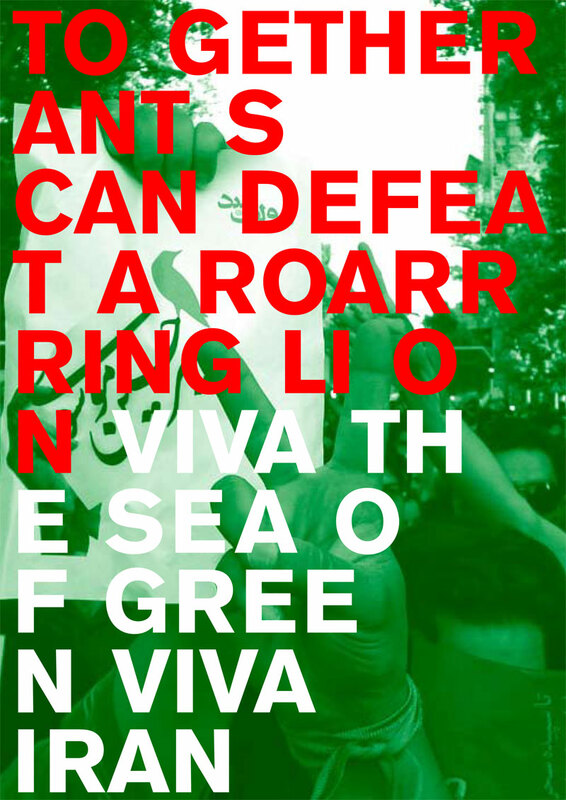 Previous: UPDATED: From La Paz, a poster for Iran. For the Sea of Green: Persian proverb. VIVA The Sea of Green,VIVA Iran,Hope for Peace in all of the world. Thank you, Omid, am so happy and grateful to hear from you. sehr klug, das abgetrennte ” s ” bei den Ameisen ds ist gelungen…… grau teurer Freund ist alle Theorie, und gruen allein des Lebens goldner Baum… jetzt ist Schluss mit Theorie, die Taten entscheiden jetzt. Excellent Erik- ants can indeed defeat. Hopefully the repression will give way to the will of the people. This entry was posted by Erik Brandt on Thursday, June 18th, 2009 at 2:34 PM	and is filed under Aktuell, Education, Free Radicals, Geotypografika, Globalization, Graphic Design, International, Internet, Minneapolis, News Links, Poetry, Typografika, Typography, Unreasoned Love.